I was privileged to stay with the Samara family in Bil’im, a village in occupied West Bank of Palestine. It is a village surrounded by olive orchards, vineyards, family gardens, and grazing lands on which goats and sheep are grazed. I was fortunate to be able to see Mr. Samara’s daughter-in-law prepare Haloumi, a Palestinian White Cheese almost always served with breakfast. If you need a primer course on how to make cheese, see in information in the “Related” section below. 1) Warm 1 gallon milk in stainless steel pot to 32 C.
2) Dissolve ½ tablet of rennet in ¼ c water. (You may use 1 tablet for more rapid setting.) Meanwhile, suspend 1/4th cup yogurt in ½ cup milk. 3) With continuous stirring, slowly add the dissolved rennet and the suspended yogurt to evenly distribute. 4) Cover the pot and let sit undisturbed at room temperature until you get a clean break (see the basic cheese page), about an hour. 5) Cut the curds as instructed on the basic cheese page, to produce curds about ½ inches in diameter. 6) Cover again, let the curds sit to firm up for 10 min. 7) Pour the curds into a sterile cloth suspended in a colander. Hang the cloth, allow to drain for 6 hours in a cool place (in the fridge in the Summer). Save the whey for “cooking” and making brine. 8) Remove the ball of cheese and cut into 6 pieces. 9) “Cook” the cheese: bring the whey to 45 C, and add the 6 pieces. Keep at 45 C for an hour. 10) Remove the cheeses from the whey, salt the surface, and chill for several hours. 11) Bring ½ gallon of the whey to the boil, add 2 ounces Kosher salt (1/4 cup), stir to dissolve, cover and let cool. 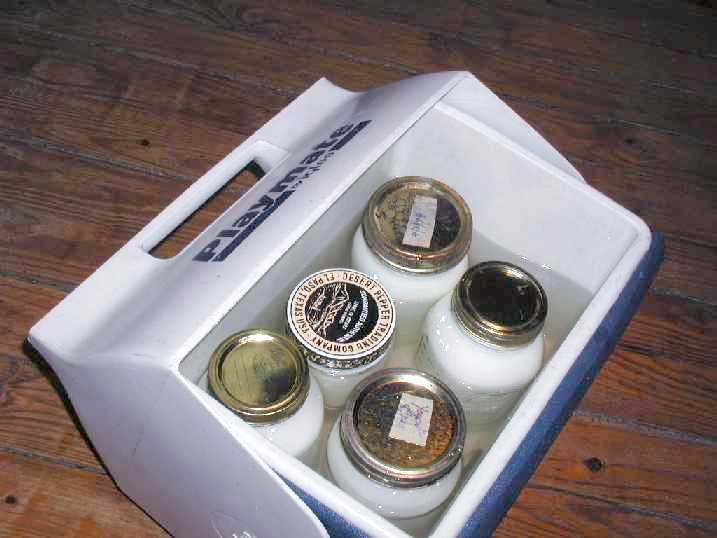 12) Transfer the cheeses to the cooled whey in a plastic tub with a lid. Place in the fridge. You may eat it immediately, but the flavor improves after several weeks or a month. Images taken around the Samara family’s home. As with many other recipes, crush the fresh garlic under your heavy French knife. Chop the garlic prior to grinding in the mortar and pestle. Add the chopped garlic to the mortar and pestle. Add one teaspoonful of salt (using Kosher salt here, as a gesture of brotherhood with the Israelis…) You may want 1 1/5 tsp. salt, depending on your tastes. Using the salt as a grinding agent, grind the garlic well in the mortar and pestle until well blended. Add a small amount of yogurt to the mortar, and grind to suspend the garlic, etc. Optional: Peel the cucumbers. (Usually I do not, since I do not mind the skins. In fact, I think they add both esthetic and possibly nutritional components. Combine the macerated seasonings in a large bowl with the yogurt and mandolined cucumbers. Stir. Chill. Serve in an attractive bowl, a cup into each individual bowl, and garnish with a sprig of fresh mint. Here are some pictures of my initial attempts at smoking food with a Brinkman “Gourmet” charcoal smoker. I confess to being confused about what constitutes “cold smoking,” but can tell you that if you run the smoker at “ideal,” food will get overcooked and dehydrated within several hours. 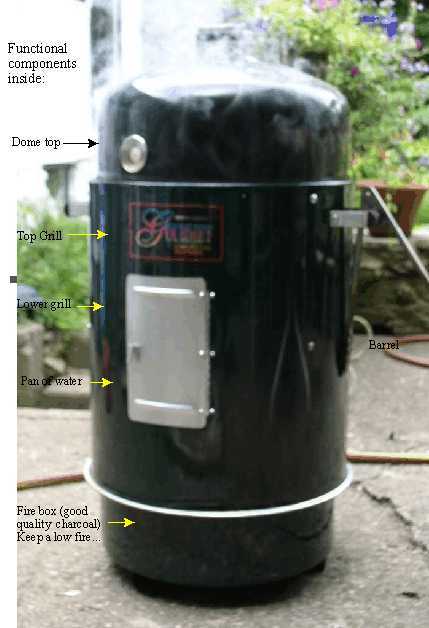 Here is a picture of the smoker with internal functional components indicated. Use quality wood charcoal (not briquettes–they stink) and/or good hardwood/fruit wood for the fire. Keep it at a VERY low level. Fill the pan above the fire with water. There is a grill above the water which can be used for smoking, but I have not determined the ideal parameters of using that grill. There is a door into the barrel which MIGHT be of use, but I used it mainly to judge the level of the fire. WAY to big a fire for “cold smoking!” Note that a combination of wood and hardwood sticks are being used. Let the fire settle down before placing the barrel on top of the fire box. The fire has died down, and ready for the barrel to be placed. Looking down in the barrel, you see first the lower grill on which a cheese to be smoked is placed. Below (barely visible),. is the pan of water. Here I am smoking pieces of fresh salmon. I have found that “left over” pieces often make excellent smoked portions. I tried many different foods (my wife says I went crazy…) 1) Chicken was great–you may not want to eat the skin, it being VERY smoky. 2) Homemade goat cheese: DELICIOUS. But see the next frame for a caution. 3) Pork chops: got very dry, but flavor was good in stirfry or hash. If you smoke at too hot a temperature, you get a “cheesey” situation: I cut a 5 pound goat cheese in half, and smoked both halves. The “bottom” half seemed to explode (!) but still tasted good, while the top half was wonderful.